Since ancient times of Babylonia and Egypt, the people of the Middle East have used miswak to brush their teeth. 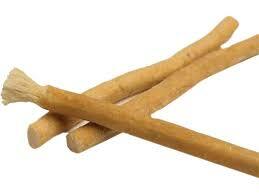 Miswak is made from the Salvadora persica tree. People have cut thin branches or the roots to create natural tooth brushes. Here is my video explaining how. Miswak has natural antimicrobial properties, much like honey or echinacea. Some studies have been done with people in Saudi Arabia and also in Sudan to check their dental hygiene and they were found to have just as good periodontal care compared to people who use toothbrushes. In addition to strengthening the gums, preventing tooth decay and eliminating toothaches, the miswak is said to halt further decay that has already set in. Furthermore, it is reputed to create a fragrance in the mouth, eliminate bad breath, improve sensitivity of taste-buds and promote cleaner teeth. To use miswak, cut a piece as big as a toothbrush. Whittle the bark off a bit of one end and then chew the end a bit in order to loosen the fibers to create bristles. The miswak should be softened, so if it has dried out, it needs to be soaked or sucked on to get it moist and supple again. Scrub your teeth with the bristles. For best hygiene, cut the bristles off and start another whittle end for each use until you've used the entire stick. Miswak is mentioned in the Koran as recommended by the prophet Muhammed for proper hygiene.